The Polish Navy may be small, but it actively participates in many international exercises and NATO operations. Its core consists of two unmodernized Olivier Hazard Perry frigates (short hull), three Fast Attack Craft (FAC) upgraded with RBS Mk3 missiles and Thales C2, three minesweepers turned modernized mine-hunters, four German-designed Kobben-class diesel coastal submarines, and a Soviet-era Kilo-class. 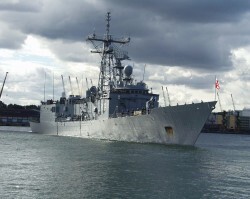 In March 2012, the Polish Ministry of Defense announced a long-awaited Navy modernization plan. In contrast with previous practice, the plan has been made public (unsurprisngly, but perhaps unfortunately for readers of NextWar, in Polish). The new plan foresees replacing virtually all existing ships (except the newly modernized Orkan-class FAC) within more than 25 years. In simple terms, we’re talking about the complete reconstitution of all Navy platforms. Yet, many people remains skeptical. One reason is a previous plan, stalled for 10 years, to build a series of Gawron corvettes. Recently Ministry of Defense decided that the ship will be finished as a patrol corvette with ASW capabilities. But this skepticism has a deeper roots and to understand it better we need to look at broader context. The necessity of a navy, in restricted sense of the word, springs, therefore, from existence of a peaceful shipping, and disappears with it, except in the case of a nation which has aggressive tendencies, and keeps up a navy merely as a branch of the military establishment. 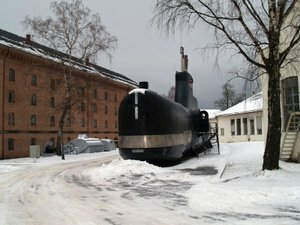 “I know I left my sub somewhere….” A former Kobben-class, now a museum. The Polish Navy finds its purpose from the first part of the above phrase, while the General Staff is more concerned about other countries taking theirs from the latter portion. In fact, both the MoD and BBN (National Security Bureau), following the logic “home first,” have defined the area of interest for the Navy as “Baltic Plus.” BBN’s recently concluded survey on the security environment of Poland stated that there is no danger of open armed conflict in foreseeable future. However, Prof. Stanislaw Koziej, who leads BBN, is concerned about the fact that Poland is a frontier country of the European Union and as such is exposed to some tensions and conflicts. Not surprisingly the most recent investment for the Navy was a shore battery of the Kongsberg anti-ship Naval Strke Missile (NSM), while the next priority is for new submarines, mine hunters, and then ASW helicopters. Poland is geo-strategically located between two traditional European powers – Germany and Russia. All armed conflicts with these two powers have been resolved on land. Likewise, the 17th century wars with Turkey ended with a great Polish victory at Vienna, far from the sea. The only war with an important, although not decisive, naval episode was the war with Sweden. 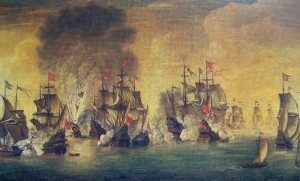 In 1627, the Polish fleet achieved victory over the Swedish squadron at Oliwa. The Polish Navy was restituted immediately after regaining independence in 1918. 20 years later, a young and small navy unable to save the country continued its fight at the side of the British Royal Navy. One participant of these struggles, the destroyer Blyskawica has been depicted by CDRSalamander in his Fullbore Friday series. The Polish Navy, rightly proud of its traditions, nevertheless historically had little influence on the outcome of wars of the past. And this is probably the General Staff’s point of view. A few years ago, the investment budget of all the Armed Forces was centralized. All projects now compete for resources within the same structure of the MoD. Such centralization theoretically allows for better spending of scarce money, but it leaves Services without control over their own future. Even much bigger navies have from time to time had problems in justifying their mission, a problem amplified for a small navy in a continentally oriented country. Although there are shipbuilders in Poland with profitable operations, none of them is now involved in warship design and construction. The dilemma therefore follows: should a navy rely on foreign construction and unknown support or on a local industry which has no expertise. It is possible to build such expertise over time, but is Poland’s new modernization plan enough to support such a venture? As outlined above, some skepticism has well-founded reasons. On the other hand, my belief is that a navy should be confident in its better future, and the reason is simple. Poland, as a young member of the European Community, wants to be active in the international arena. Operations in Iraq and Afghanistan allowed our Armed Forces and politicians to learn a lot. The price of these lessons is high and the next step is discovering that using a navy to express political will is typically much cheaper.